Buffalo Dreams Fantastic Film Festival will host an advanced screening of the drama Two for One as its opening night feature. BUFFALO, N.Y. - Sept. 30, 2016 - PRLog -- The festival runs Nov. 4th - 10th at Dipson Theatres' Eastern Hills Cinemas, located in the Eastern Hills Mall, 4545 Transit Road in Williamsville, and Saturday Nov. 12th and Sunday Nov. 13th at the Screening Room Cinema Cafe, located in the Northtown Plaza in Amherst. 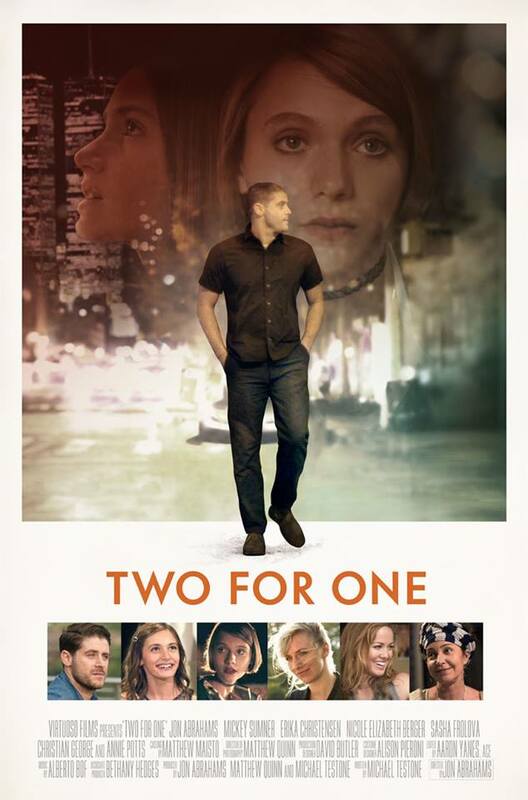 Two for One stars Jon Abrahams, who also directed, and co-stars Annie Potts, Erika Christensen, Sasha Fralova and Nicole Elizabeth Berger, with additional performances by Scott Caan, Jason Biggs, Martin Donovan and local actor Stephen McKinley Henderson. Two for One was written by Michael Testone, who produced the film with Abrahams, cinematographer Matthew Quinn and Bethany Hedges, and filmed primarily in Buffalo. The film tells the story of a young up and coming artist in New York City whose life and dreams are forever altered when the tragic events of 9/11 take the lives of his two best friends and he accepts guardianship of the couple's two young daughters. Eleven years later, he raises the girls as his own, but the financial grind of living in Manhattan is too great, and he moves the girls to Buffalo, where he grew up. This non-traditional family must now adjust to a new life in the Queen City while trying to find themselves along the way. "We're thrilled to give Buffalo area residents their first opportunity to see this wonderful film," says Buffalo Dreams co-founder Chris Scioli. "It's a comedy-drama with an excellent professional cast, and offers a positive portrayal of Buffalo and its people. Patrons will relate to these characters as well as the familiar locations. It's a first rate film that will get this year's festival off to a strong start."